Picasso is back in fashion. The artist’s “Les Femmes d’Alger (Version ‘O’)” set a new $179 million all-time auction record at Christie’s in New York on Monday evening, part of a $706 million sale that mixed impressionist and contemporary works. The results suggest art sales – and central banks’ quantitative easing – are in fine fettle. Christie’s also set a new sculpture auction record for Giacometti’s “Pointing Man”. The sale was deliberately full of high-quality lots, but even so the auction house is making arch-rival Sotheby’s look leaden-footed – and that’s even before the regular Christie’s sales in the impressionist and contemporary categories. Sotheby’s, a target of activist investors including Dan Loeb’s Third Point, sold $368 million of impressionist and modern art last week. Unlike contemporary art, where Christie’s has been dominant of late, Sotheby’s had looked strong in impressionists – but may now feel slightly upstaged. Christie’s is holding a separate sale in the category on Thursday, though the auction that included the Picasso may have absorbed the best lots. Like stocks and many other assets, art works keep setting new records. One widely touted reason is easy money policies around the world. Though bond yields have lately shown signs of edging higher, the thrust of so-called quantitative easing is continuing. That makes funding relatively cheap and pushes prices up – for Picassos and Giacomettis as well as shares. In the case of the record-setting Picasso, there’s also a demonstrable financial return – at least historically. In November 1997, it sold at Christie’s for $31.9 million. Run the numbers, and that’s about a 10 percent annualised return over nearly 18 years. That helps explain why more new price records, for individual artists if not overall, are likely even within days. 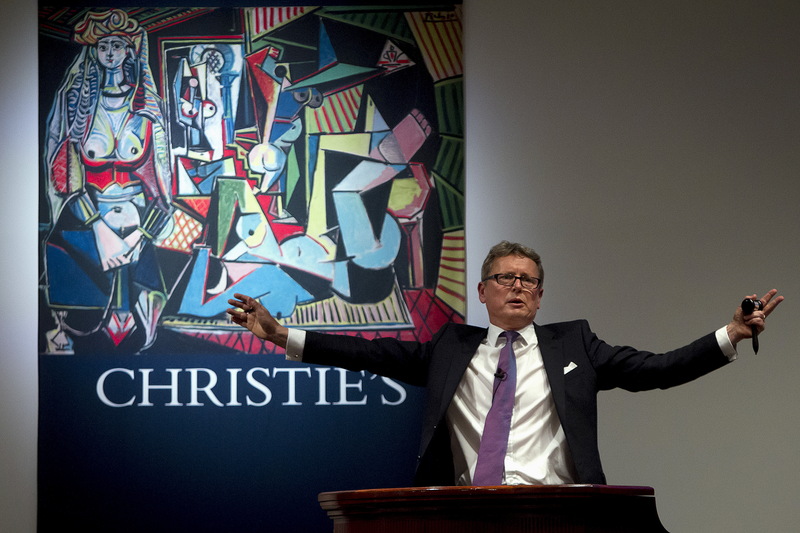 Auctioneer Jussi Pylkkanen calls for final bids before dropping the gavel as he sells Pablo Picasso's "Les femmes d'Alger (Version 'O')" (Women of Algiers) at Christie's Auction House in the Manhattan borough of New York May 11, 2015. A Picasso oil painting from 1955 smashed the record for the most expensive artwork ever sold at auction when it soared to $179.4 million at Christie’s in New York on May 11. The auction house had estimated “Les femmes d’Alger (Version ‘O’)” would sell for about $140 million, but several bidders competing via telephone drove the winning bid to $160 million, for a final price of $179,365,000 including a commission of just over 12 percent. The most expensive work of art previously sold at auction had been Francis Bacon’s triptych “Three Studies of Lucian Freud”, which sold for $142.4 million at Christie’s in November 2013. Giacometti’s 1947 sculpture, “L’homme au doigt” (Pointing Man), set a world record for a sculpture, selling for $141.3 million. The special “Looking Forward to the Past” sale, which spanned collecting categories to include artists from Monet to Warhol, took in a total of $705.9 million, above the pre-sale estimate of $578 million to $668 million. Only one of the 35 works failed to sell.